I struggled with influenza at 10. And then I had to reschedule my birthday party twice. The first time, I had a fever. The second time, I woke up with nausea and low blood sugar. The third time was a charm. My house was filled with boxes on my 13th birthday. Everything seemed so unsettled around me. We moved two days later. It wasn’t a surprise. I knew they were planning it. Around my 19th birthday, I was dating a guy for a couple of months. He took me out for my birthday dinner somewhere on The Hill in St. Louis. When the check came, he asked me to pay for my own meal… but to slip the money under the table so no one could see that I was paying for myself. I’m not sure how I allowed that relationship to last three more months. I waited around for my boyfriend to join me at my parents house to ring in birthday #20. I waited. And waited. And waited. And I believe tension blossomed when he finally showed up. Celebrating my 21st birthday by going out at midnight. I celebrated with the boyfriend, another classmate and my friend Lisa who died just a year ago. The day after my birthday, I headed up to Canada to watch my grandma die. Twenty-two was spent at a small but laid-back and cheerful gathering at my friend Mike’s apartment. I celebrated 23 in Florida. I had just interviewed and received my first real job. My friends surprised me with a party for 25. I didn’t have a clue they were planning my birthday. But then it had crossed my mind that a party could be in the works as I walked into the restaurant. I was surprised that time. Then, the day after my 25th birthday was one of the most heartbreaking nights I’ve had in any relationship. My 30th birthday was the day Baghdad fell. And I cried when realizing what I had not yet completed in my life. 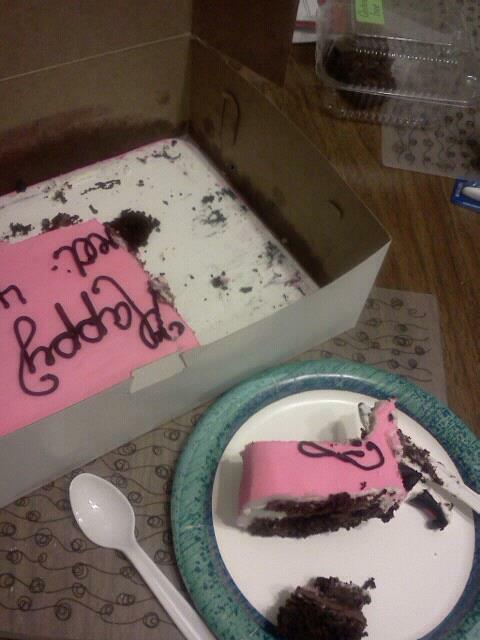 But my birthday cake was delicious. On my 31st birthday, mom, dad and I went to the Magic Kingdom in Orlando. It was delightful. Because I was wearing a “It’s my birthday” button, I was wished “Happy Birthday” by countless strangers that day, most of whom were Disney employees. My 32nd birthday was to be celebrated with another guy I was kind of seeing. But then he kept delaying and delaying getting together with me. I waited. And waited. And waited. And much later that evening, he finally called me after deciding to hang out with his adult nephew. The next day, he gave me my birthday gift: glass jars. From the time I was 35 until 37, I celebrated my birthday with seminary friends in St. Louis. Usually, we would gather at Schlafly’s Bottleworks in Maplewood. When I went back there for my 39th birthday, the restaurant was closed for the evening, and the party had to be moved to Roadhouse in Webster Groves. I believe I’ve gotten more birthday smiles from strangers than old boyfriends. But nothing compares to the birthdays I’ve spent with my friends and family who encircled me with love. Now that I’m 40, I’m going to say it: I’m happy I’m not married to any of these guys. Shouldn’t the people who say they love and cherish us live up to their promises – at least one day of the year? Or give us a gift that has personal significance (even if they didn’t pay much for it)? If they spend time with us, shouldn’t the words they use be words of love? Lost loves: I’m glad I’ve know you. I’ve learned much from you. But now I’m looking towards the future where I am treated with dignity. Gifts aren’t necessary. But when they are given, the greatest gifts are given from the heart and not the pocketbook. Frankly, the greatest gift is time. No birthday is perfect. The more we try to perfect the day and raise our expectations, the more the day disappoints us. When the unexpected happens or when expectations are low, then the day can only get better. Each and every birthday greeting warms my heart. I don’t care if I know you or how I know you, when you wish me “Happy Birthday”, you have ignited my soul. Thank you. Michelle, this was a very, very heartfelt post. Getting to know you as I have over these last 5+ years I also would believe it was very difficult for you to write. I believe however that this post confirms for me what I told you the other night after we had our birthday dinner and Ted Drewes. You have come a long way and grown much over this time we have known each other. You know who you are and you are comfortable with who you are. I love you my friend and I cherish our friendship even when it is long distance and mostly lived out on Facebook. It makes our time when we are in each others company more special. I know that it is tomorrow in you part of the country even though it is still today here, so I will wish you a very HAPPY BIRTHDAY. Thank you my friend! Your comment brings me much joy! 🙂 And I’m glad we celebrated last week! I echo Dennis’ comment and want to say how much I appreciate both of you for the wonderful people you are and what you have meant to me! Thank you my friend! You both mean so much to me too!